And the last cake post this year….? One more cake post….. Awww, come on! I’ve only posted two others so far this year….! I just had to share the wonderful Firetruck Cake that 7YearOld made for his school fete competition. Judging is tomorrow – he has all his fingers crossed he wins! Please leave a comment and let him know what you think. He will be chuffed to get some feedback from you. And yes he did it all himself. He had some guidance from me but he followed this fantastic tutorial from Ann Reardon of How To Cook That. Her site is terrific. Check it out if you need a WOW cake that even a 7 year old can follow. My post on our tragedy of Ann’s Lightning McQueen cake is here. And BabyGirl’s Birdy Cake post is here. 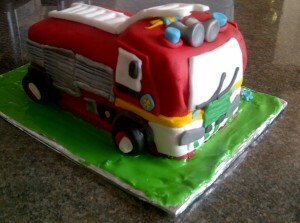 This entry was posted in Recipe and tagged birthday, how to make a firetruck cake by Mamasim. Bookmark the permalink. Took him a while but he got there! That is like totally AWESOME!!!! Awww thanks, NicBak. It is like totally rad! What a fabulous cake, I can’t believe it! How clever 🙂 Good luck! What a great cake. Well done Mr 7YearOld! Thank you Julia. Will pass on the comment, 7YearOld will be thrilled! I’m awestruck! What a fabulous job he made of it. It certainly deserves to win. Thanks Alana. Will let you know!